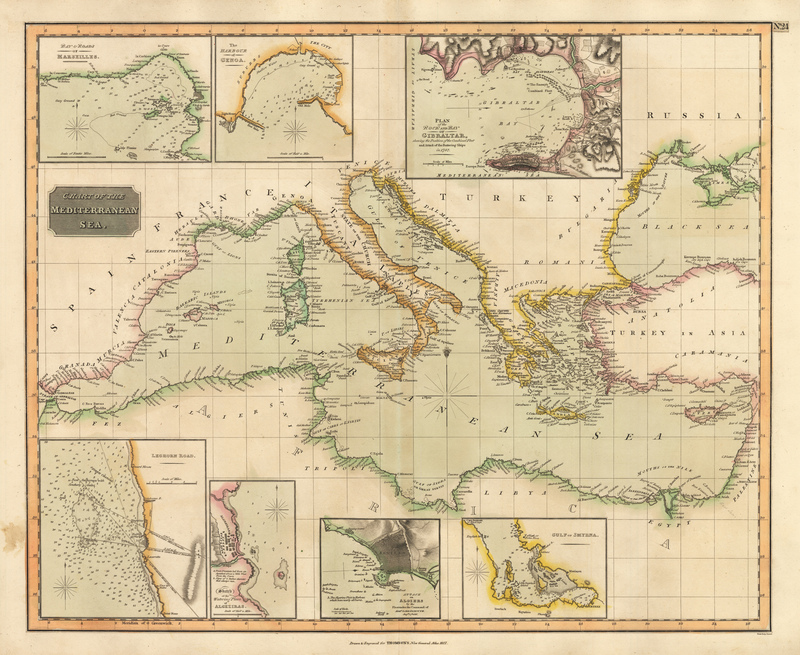 This elegant large map of the Mediterranean Sea and the countries surrounding it was published in Johnson’s Atlas in 1817 with original hand coloring. The Sea fills the central portion of the map, along with the edges of the continents which form its boundaries. It also includes the Black Sea and the countries which border it. Seven inset maps provide even more highly detailed information regarding a number of port cities. Despite stagnation and a degree of decline, the Ottoman Empire still held much of the territory depicted here as it had since the reign of Suleyman the Magnificent. Here it extends rather far into Europe. Though not depicted as such, all of northern Africa was dominated by the Ottomans, as were the territories on both sides of the Red Sea. The region from the southern shore of the Black Sea to the Caspian, and a wide section of territory reaching from the Caspian to the Crimea was still under Ottoman rule. However, within a short time of the publication of this map, the Ottoman Empire fell into steep decline, with Greece declaring war on the reigning Sultan in 1821, following which turmoil within the ruling house led to further losses of territory and influence. In addition to Ottoman territories, the southern coastline of Europe reflects many states which claimed governance at the time. A few examples include Granada, Murcia, Valencia and Catalonia in Spain, various Italian states, with the remaining territory designated as Turkey, though it was Ottoman, as far as the Crimea, where it becomes Russia. Condition: This map is in A condition with very light toning at the centerfold. Published colored.